I'm the Cultural Consultant on this fabulous new play, set in Afghanistan. The World Premier of THE MOST DANGEROUS HIGHWAY IN THE WORLD is with Golden Thread production in San Francisco. Here’s a little about the play. A fearless eight-year old businessman makes his living directing traffic with a soda bottle on the highway connecting Jalalabad to Kabul. Soldiers, accidents, and ghosts are no match for this little fighter with a knack for surviving the toughest challenges. Inspired by a New York Times article about the real-life “Pepsi bottle boys” of Afghanistan, this poetic play introduces an up-and-coming writer of great promise. Kevin Artigue is a graduate of Public Theater’s prestigious Emerging Writers Group and the first playwright of non-Middle Eastern descent to be produced on the Golden Thread mainstage. He has been developing this play with Golden Thread for three years, including as part of the 2014 National New Play Network’s showcase. 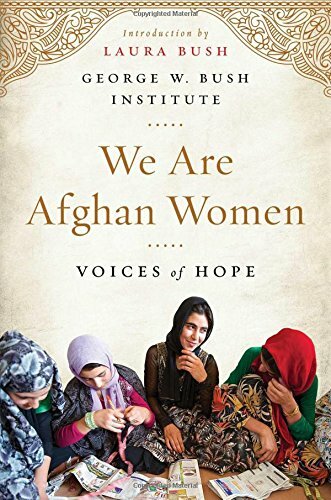 With an introduction by former First Lady Laura Bush, WE ARE AFGHAN WOMEN: VOICES OF HOPE chronicles the lives of young and old, daughters and mothers, educated, and those who are still learning. These determined women are defying the odds to lead Afghanistan to a better future. Their stories are a stark reminder that in some corners of the world the struggle continues and that women’s progress in society, business, and politics cannot be taken for granted. Their eloquent words challenge all of us to answer: What does it truly mean to be a woman in the twenty-first century? Here are Afghan women in their own words. Words that are by turns inspiring, moving, courageous, and heartbreaking. Their powerful stories create a compelling portrait of the lives, struggles, and successes of this extraordinary nation and its extraordinarily resilient women. With an introduction by Laura Bush, honorary founding co-chair of the U.S.-Afghan Women’s Council. Afghanistan has been described as “the worst nation in the world to be a woman.” More than fifty percent of girls who are forced into marriage are sixteen or younger. Too many women live in fear and in many areas, education and employment for women are still condemned. The women featured in We Are Afghan Women are fighting to change all that. From rug weavers to domestic violence counselors to business owners, educators, and activists, these courageous women are charting a new path for themselves, their families, their communities, and their nation. Told in their own voices, their stories vividly capture a country undone by decades of war and now struggling to build a lasting peace. Meet Dr. Sakena Yacoobi, who ran underground schools for girls until the Taliban fell, and today has established educational centers across Afghanistan to teach women and girls basic literacy. Or Freshta Hazeq, who as a female business owner, has faced death threats, sabotage, and even kidnapping threats against her children. Naheed Farid is the youngest female member of Afghanistan’s parliament. During her campaign, opponents cut Naheed’s face out of campaign posters and her family risked complete ruin, but her husband and father-in-law never wavered, encouraging her to persevere. Here, too are compassionate women such as Masooma Jafari, who started a national midwives association. Her own mother was forced into marriage at age twelve and gave birth to her first child at age thirteen. RETURN TO THE LITTLE COFFEE SHOP OF KABUL the honest, entertaining and life-affirming sequel to The Little Coffee Shop of Kabul, featuring the same loveable cast of characters, from internationally bestselling author Deborah Rodriguez. In a little coffee shop in war-torn Kabul, five very different women unite for one important cause: to protect the women in Afghanistan. Now back home in the US, SUNNY, the founder, is finding it difficult to settle and dreams of returning to her beloved coffee shop. SHEA is haunted by a traumatic event that makes her renounce her Afghan heritage. YAZMINA, the coffee shop's new owner, wants to use her newfound security to help other women avoid the fate she narrowly escaped. ZARA, promised in marriage to a violent man she's never met, arrives at the coffee shop seeking sanctuary. And HALAJAN, the grandmother still breaking all the rules, is secretly learning to drive ...Together, these five women set out to change their lives, and the lives of women in Afghanistan, forever. I’m pleased to share that four of Afghan Culture Unveiled Recipes are included in this book.